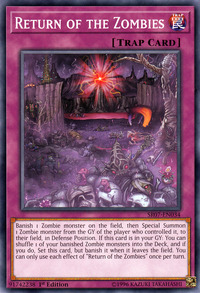 Banish 1 Zombie monster from the field, then Special Summon 1 Zombie monster from the GY of the player who controlled it, to their field in Defense Position. If this card is in your GY: You can shuffle 1 of your banished Zombie monsters into the Deck, and if you do, Set this card, but banish it when it leaves the field. You can only use each effect of “Return of the Zombies” once per turn. Bone Mouse, Goblin Zombie, Dark Spirit of the Silent, Zoma the Spirit, Zombie Master, Reborn Zombie, Temple of Skulls, 'Berserk Dragon, Doomkaiser Dragon, Uni-Zombie, Glow-Up Bloom, Shadow Ghoul, Tour Bus From the Underworld, Plaguespreader Zombie, Zombie Mammoth, Despair from the Dark, Soul-Absorbing Bone Tower, Sea Monster of Theseus, Violet Crystal, Dark Assailant, Foolish Burial and Call of the Mummy" appear in this card's artwork.